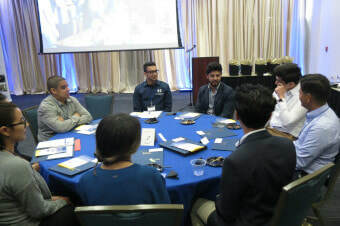 The California Alliance for Minority Participation (CAMP) program hosted their inaugural Alumni Roundtables event on Friday, April 5th, from 5:00PM-7:30PM at the UCI Student Center. 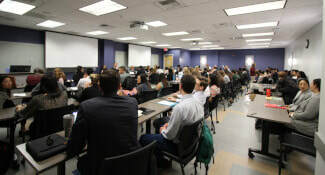 The event was designed to provide a space for alumni to have meaningful conversations with students about how they may successfully navigate their academic and professional experiences. 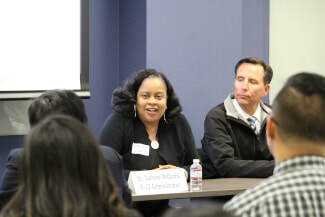 The structure of the program provided an opportunity for alumni to give back, and share advice about how underrepresented students in STEM might position themselves for success. Participating students were advised to bring their resumes or curricula vitae to help outline their work, and to hear from alumni about how they might consider moving forward. The documents enhanced conversations with alumni, and were used to identify whether represented companies might have opportunities for internships, research, or employment. Students heard inspirational remarks from Vice Provost for Academic Equity, Diversity and Inclusion Dr. Douglas Haynes. 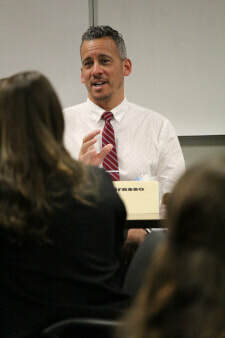 His talk focused on how students are embedded in an academic ecosystem that is focused on their academic and professional success, and discussed how CAMP is a hub of resources. Following, Dr. Jose Romero-Mariona, Computer Scientist at Space and Naval Warfare Systems Command (SPAWAR), gave a powerful message about his journey as a scientist, the importance of CAMP engagement, and the utility of persistence. Student then spoke with alumni to learn about their journeys, and how they overcame obstacles to achieve their academic and professional goals. 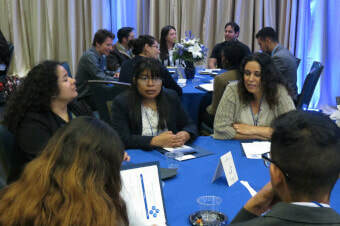 There were seven roundtables, each with at least two alumni, ten students in the same area of study, and conversation starters to help facilitate meaningful discussions. The event was a success and laid a solid foundation for future programming focused on CAMP Alumni /student engagement. A special thank you to the Center for Educational Partnerships, and the School of Education, for their continued support. 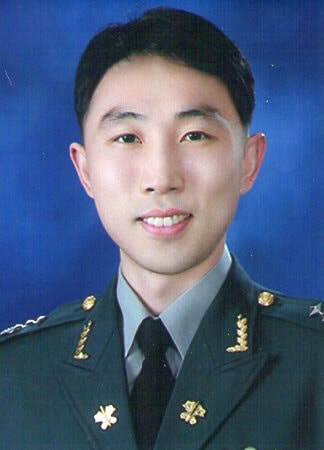 Alumnus Hansol Lee, PhD, has been promoted to Associate Professor at the Korea Military Academy (KMA) in Seoul, Republic of Korea. KMA is equivalent to the United States Military Academy (USMA) at West Point, New York. As a Republic of Korea Army major, Hansol is teaching academic and military English and conducting military-related research. As an applied linguist, Hansol also is involved in language related policies, programs, and projects in and outside the Korean military. Hansol received his PhD in Education, specialized in Language, Literacy, and Technology, in December 2018. He credits his rapid promotion from assistant to associate professor to his academic achievement during his doctoral study, which includes eight publications in high impact journals. As a doctoral student, Hansol was advised by Professor Mark Warschauer. UCI School of Education students attended the annual California Association of Bilingual Educators (CABE) conference, held March 20-23 in Long Beach California. During the conference, Araceli Jimenez received a 2019 Chuck and Estella Acosta Teachership Award, given to support an outstanding college or university student pursuing a bilingual teaching career. 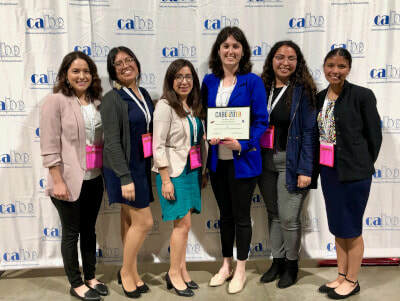 This year, all six UCI bilingual elementary Master of Arts in Teaching students were able to attend the CABE conference in Long Beach, supported in part by a grant recently awarded to the School of Education. The students attended various workshops, met several district representatives from dual immersion schools, and cheered fellow MAT student, Araceli Jimenez, at the awards luncheon on March 21. Araceli Jimenez is the 10th bilingual MAT student to receive a teachership award from CABE (see below). She received the award with other aspiring bilingual teachers that were selected and was among other noted recipients receiving distinguished awards for their dedication to the field of bilingual education. Pursuing a career as a bilingual teacher was something that captured the interest of Araceli Jimenez ever since she started to work with students in schools within her community. In these schools, the students had similar backgrounds to hers, which created a connection between them - a connection where there was a sense of belonging and acceptance based on their similar cultural assets . 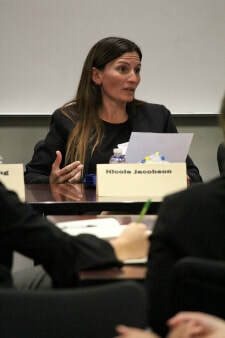 AraceIi believes that bilingualism plays an important role in education because learning two languages expands children's cognitive skills: "Children have the opportunity to thrive in a diverse society where they learn about another culture, another way of life, and/or make connections within their own culture." Araceli says this helps children to become more open-minded and learn to accept differences, in order to create a collaborative learning environment. Araceli relates that when she was a long-term substitute AP Spanish teacher at a high school, students were struggling because they hadn't had a regular, continual teacher present in their Spanish class. As challenging as it was, Araceli moved forward because her goal, as a bilingual teacher, was always to create an effective learning environment where students are taught concepts, knowledge, and skills through the language they know best, and that are then reinforced through the Spanish language. Araceli explains, “Once students saw my commitment in cultivating their curiosity and interest in learning, they became more motivated to learn and gained a better sense of themselves and their futures as bilinguals." Her student teacher supervisor believes that AraceIi will make an excellent teacher and leader. He says that during his classroom observations, Araceli demonstrated the skills, content knowledge and demeanor necessary to develop into a professional bilingual educator: “Araceli believes that as a bilingual teacher, she will make a difference in the lives of her students and her professors are certain that she is bringing the same sense of self-efficacy to her studies at UCI." In addition to working as a long-term substitute at a high school, Araceli has had other educational roles, such as a small group math instructor, after-school instructor, and Education and Outreach intern. Her supervisor describes Araceli as committed to working in the dual immersion field and showing great promise. Another of her professors states that Araceli is strong in lesson organization, communication in both languages and planning appropriate support for all learners. Her student teaching assignments so far include two-way immersion in Spanish, third-grade immersion in Spanish, and, currently, student teaching in a sixth -grade two-way immersion classroom in Spanish. As a native Spanish speaker, from a home where Spanish is still used as the main form of communication, Araceli values her home culture and language and knows that it is very important to her identity. She intends to be a teacher that strongly promotes social justice and celebrates cultural and linguistic diversity in her future classroom. 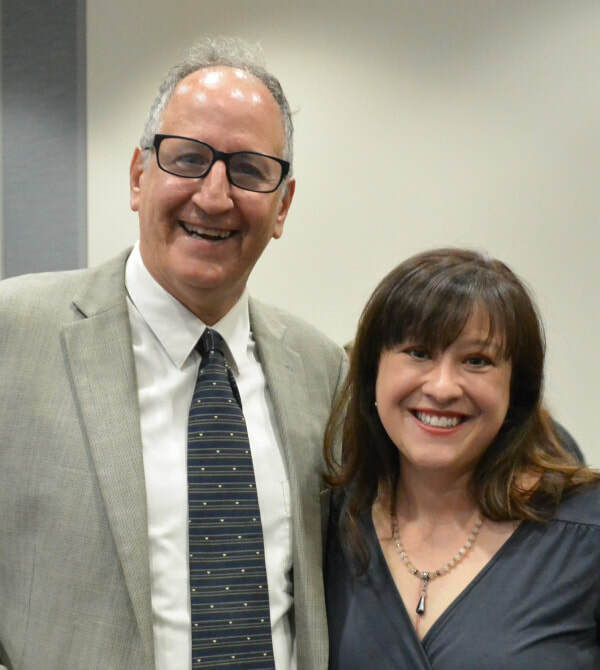 About the Charles and Estella Acosta Teachership Award: ​Chuck Acosta's education career spanned 35 years which includes being a bilingual education consultant for the Los Angeles County Office of Education. Chuck served on many local, county and state educational committees. Through his work and vision, he influenced many educators and state legislators. Chuck Acosta was one of the co-founders of the California Association for Bilingual Education (CABE). Without his vision, tenacity and true belief in the power of bilingual education, CABE would not exist today. He knew that with the growing number of English Learners in California, we would need an organization to be a powerful source of grass-roots advocacy; political clout and also be the premier source of professional development for teachers, administrators, para-educators, and parents. Assistant Professor Jade Marcus Jenkins has been feted as the School of Education Dean's Honoree for excellence in teaching at UCI's 26th annual Celebration of Teaching, held April 18 at the UCI. 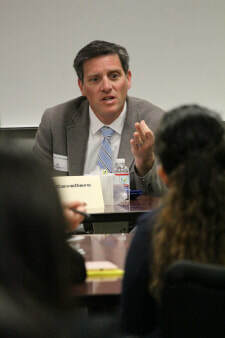 The 2019 event, sponsored by the UCI Academic Senate Council on Teaching, Learning, & Student Experience (CTLSE) and the Vice Provost for Teaching & Learning, was hosted by the Division of Teaching Excellence and Innovation (DTEI). During the afternoon ceremonies, Dr. Jenkins was recognized for her important contributions to the School of Education's undergraduate program. She has taught a required course in the undergraduate program, Origins, Purposes, and Current Issues in Education, and developed a new course, Education, Poverty, and Social Change. She demonstrates her commitments to teaching through using a variety of pedagogical practices, combining lecture and hands-on work so students apply course concepts to their work or everyday issues in education. She has cultivated a fieldwork partnership with a school in Santa Ana that serves students from under-resourced communities and incorporates service learning for students in her class so they can directly experience and reflect on the effects of poverty on educational opportunity. The undergraduate students who study with Dr. Jenkins provide positive feedback on her teaching (she consistently receives high ratings [above 4.0 on a 5.0 scale]). Students comment on the impact of Dr. Jenkins’ commitment to her students and her passion for the topic. They also commend her for using different formats for engaging students in the course, appreciating her use of lectures, group work, and small class discussions. School of Education administrators have been particularly impressed with Dr. Jenkins’ commitment to learning new pedagogical approaches. She consults with faculty in the teacher education program to learn about ways to organize groups so that they effectively support student learning and deepen their understanding of course content. She also attends workshops on campus to learn new pedagogical practices. Finally, she collaborates with her colleagues to develop innovative lessons and assessments to elevate the quality of the learning experience for her students. I have been asked, Why this event? After my BA, I left California for long time, and I'm happy to report that I grew UNaccustomed to it, severely unaccustomed. So, when I came back to California for my PhD, some things felt a little off. But I was here to study if telehealth technologies could be used for homebound pediatric patients to attend school. I focused on that, but on the side, I tried to figure out why things felt a little off for me. I realized that I had lived in states where there weren’t many Latinos….and in those states, where I worked looked a lot like where I lived. California is so very unique in that 39% of the population is Latino. But I am working in a place where we are only 9% of the graduate students and 5% of the professoriate. So, for four years, I asked a lot of questions, listened a lot, observed, and studied the data from UCOP (University of California Office of the President) - very year. In this time, I learned that academia is also a very unique environment, and we have a very complex thing happening in a very unique setting—the largest population group in the state of California is also the most severely underrepresented in our university system. Every graduate student applied to UCI graduate programs to learn and grow in their field because that is what they want to do. That is their passion. This event is centered on that—it’s the commonality all graduate students share. There is a lot of great research being done on the UCI campus. What if we raise the visibility of our community’s contributions? Will raising awareness of achievements help us increase our representation in grad programs and the professoriate? Let’s find out. As students, we are a transient population, but there are people who stay here year after year helping student after student. No one gets to the PhD alone. There are many, many people who paved the way and helped you along. My research would not have ever happened if Mark Warschauer hadn’t taken a chance on my research idea, or if Judy Olson hadn’t taken time every week to meet with me about Human Computer and Human Robot Interactions, or if Jacque Eccles hadn’t also signed on to help me better understand child development and motivation. These people were not just my dissertation committee, they were with me every step of the way - for years. And to the staff and faculty here tonight, people who are deep in this work, when you see a grad student who is knocking it out of the park, talk to their school. We, as a community, would love to see them and hear about their achievements. We have an event now. on page 11 of the program, and we have a plaque for you! Because we are such a large portion of the California population, we unfortunately have some narratives assigned to us—mostly poverty- and immigration-centered. I’m not saying our community doesn’t struggle with those, but no one gets to choose where they are born or the circumstances they are born into. This event captures what people in our community choose to do; they get up every morning to do this work. What if we take ownership of our narrative and shift it from deficit finding to strength identifying? I loved typing the program for this event, because I am reminded what true diversity looks like—we are Latinos but some of us some of us are artists, chemists, statisticians, engineers, and some of us study robots. These are the three pillars of this event. It is a campus-wide celebration to bring together good people, share some good food, and hear some great news! Thank you for coming! 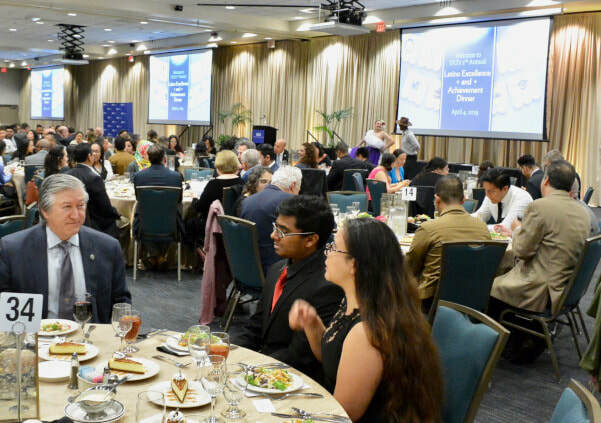 On April 4, faculty, staff, students, alumni, and community members gathered in UCI's Pacific Ballroom for the second annual Latino Excellence and Achievement Dinner (LEAD). 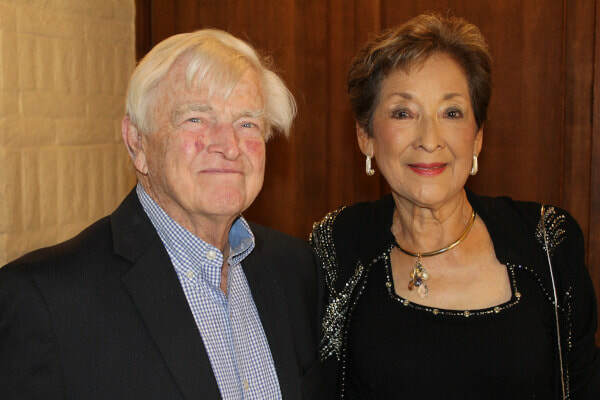 LEAD was initiated a year ago by a UCI School of Education alumna, Veronica Ahumada Newhart, who recognized that the campus needed an event to recognize the achievements and contributions of California's largest community. On April 4, the Ballet Folklórica de UCI started the evening with a set of historical dances. Chancellor Howard Gillman welcomed attendees and provided an introduction for the evening's keynote speaker, the Honorable Salvador Sarmiento, Orange County Superior Court Judge and a UCI alumnus. and she shared the experiences that had encouraged her to work to establish LEAD on the UCI campus (text of Veronica Newhart address). 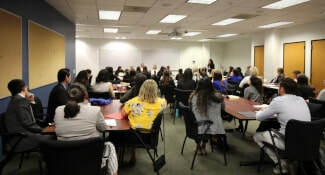 Each UCI School and department attended the 2019 LEAD event, with attendance exceeding 350. In addition to recognizing outstanding student achievers from each unit (PhD student Wendy Ochoa was the School of Education honoree), LEAD recognized four UCI campus-wide awardees. The next Latino event for the campus will be Nuestra Graduación 2019, UCI's official Latino Commencement ceremony. "Advancing CALL Research via Data-Mining Techniques: Unearthing Hidden Groups of Learners in a Corpus-Based L2 Vocabulary Learning Experiment"
PhD alumnus Hansol Lee (Korea Military Academy Associate Professor), Professor Mark Warschauer, and Jang Ho Lee (Chung-Ang University Assistant Professor) have published in the May issue of ReCALL: "​Advancing CALL Research via Data-Mining Techniques: Unearthing Hidden Groups of Learners in a Corpus-Based L2 Vocabulary Learning Experiment." In this study, we used a data-mining approach to identify hidden groups in a corpus-based second-language (L2) vocabulary experiment. After a vocabulary pre-test, a total of 132 participants performed three online reading tasks (in random orders) equipped with the following glossary types: (1) concordance lines and definitions of target lexical items, (2) concordance lines of target lexical items, and (3) no glossary information. Although the results of a previous study based on variable-centred analysis (i.e. multiple regression analysis) revealed that more glossary information could lead to better learning outcomes (Lee, Warschauer & Lee, 2017), using a model-based clustering technique in the present study allowed us to unearth learner types not identified in the previous analysis. Instead of the performance pattern found in the previous study (more glossary led to higher gains), we identified one learner group who exhibited their ability to make successful use of concordance lines (and thus are optimized for data-driven learning, or DDL; Johns, 1991), and another group who showed limited L2 vocabulary learning when exposed to concordance lines only. Further, our results revealed that L2 proficiency intersects with vocabulary gains of different learner types in complex ways. Therefore, using this technique in computer-assisted language learning (CALL) research to understand differential effects of accommodations can help us better identify hidden learner types and provide personalized CALL instruction. Lee, H., Warschauer, M., & Lee, J. H. (2019). Advancing CALL research via data-mining techniques: Unearthing hidden groups of learners in a corpus-based L2 vocabulary learning experiment. ReCALL, 31(2), 135-149. 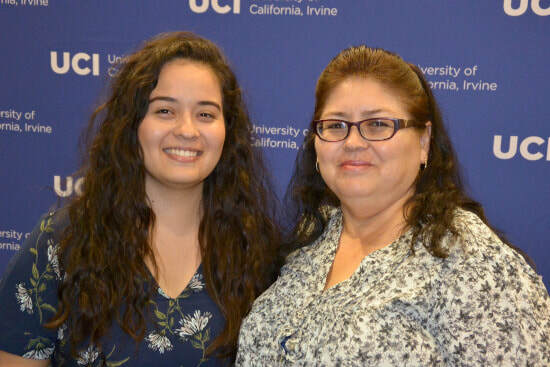 PhD student Wendy Ochoa was the LEAD honoree for UCI's School of Education at the 2019 Latino Excellence and Achievement Dinner on April 4. Wendy is a fifth year PhD in Education student specializing in Learning, Teaching, Cognition, and Development (LTCD). Her research interests include STEM curriculum integration; secondary curriculum and labor market interactions; dropout prevention and recovery; and gender, racial, and economic achievement gaps. She is advised by Associate Professor Stephanie Reich. Wendy is a Eugene Cota-Robles Fellow and a Society for Research in Child Development (SRCD) Millennial Scholar. She has consistently demonstrated academic excellence throughout her time at UCI. She is the recipient of the Keith Curry and ADSE (Associated Doctoral Students in Education) Service awards. Not only has she conducted high quality research focused on supporting low-income and diverse families, she also has dedicated tremendous amounts of time to service for DECADE (Diverse Educational Community and Doctoral Experience), UROP (Undergraduate Research Opportunity Program), SURP (Summer Undergraduate Research Program), and the Competitive Edge program - serving as a mentor, offering outreach activities, and supporting School of Education events and processes. 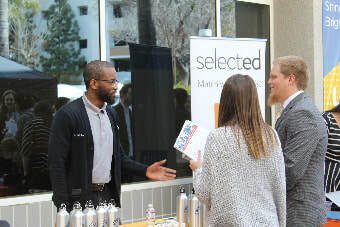 UCI's School of Education Master of Arts in Teaching + Teaching Credential (MAT) hosted their annual Job Fair for Teacher Candidates on March 26. 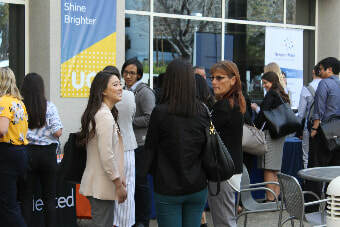 Twelve senior-level educators from area schools journeyed to UCI to offer helpful job search information for MAT candidates seeking their first teaching position upon graduating summer 2019. 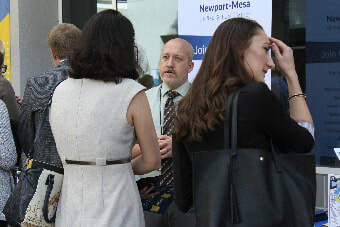 During the afternoon event, Multiple Subject (including Dual Immersion), Single Subject, and CalTeach candidates listened to expert advice about hiring processes, resumes and cover letters, appropriate interview attire and demeanor, and desired qualities in a candidate. Fifty-three Multiple Subject candidates (six in the Dual Immersion pathway) will be eligible for employment end of summer 2019. Seventy-four candidates will complete their MAT degree - five in Art, five in World Language, three in Music, 12 in Science, 13 in Math, 17 in Social Science, and 19 in English. Eighteen CalTeach graduates will receive their Bachelor's degree (12 in Science and 6 in Math) and their Single Subject Teaching Credential. CalTeach candidates currently are completing fieldwork in Title 1 Schools with large English Learning populations. At UCI's 50-year celebration, held February 5, 2016, the School of Education hosted a tribute to founding faculty, staff, and students. Rachael Mitchell was one of faculty members who contributed her memories of the early days at UCI. We are sharing historic recollections at this time with a wider audience since we believe information from the past helps in our understanding of the current accomplishments of the School. In developing the Office of Teacher Education in 1968, university leaders saw the need to provide a teacher education program for UCI graduates. There was support for a teacher education program from many of the administrators and faculty. 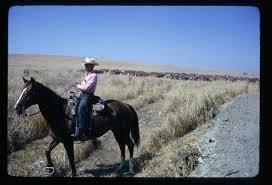 Beginning in 1970 and extending through 1972, I worked with the UCI Intern through the San Joaquin School District. (In 1973 this district became the Irvine and Saddleback Unified School Districts.) 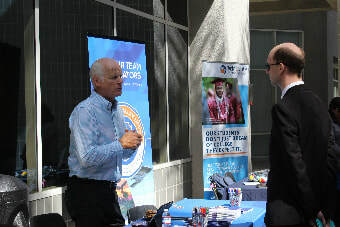 Fran Craig Kenney was the coordinator of the UCI Intern Program. 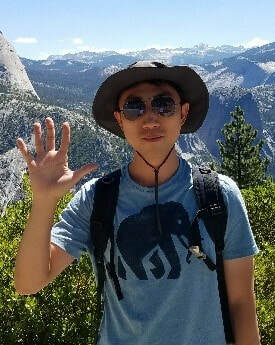 During these two years, I assisted intern teachers from UCI that were hired by the school district. This program allowed students to teach without completing their entire teacher education program. It was a win/win program for the students and the school districts. In 1972, I was hired to develop and teach the Elementary Reading Methods (105A) and to supervise student teachers. I developed the goals and objectives for 105A. 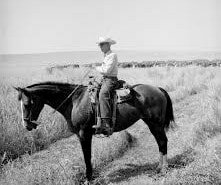 My office was in the Social Science Tower, and in the late afternoon, I would see the Irvine Ranch cowboys herd their cattle across campus! ​The elementary reading course evolved with strong support from the students and administration. Through the Irvine Unified School District, I demonstrated video reading lessons from University Park Elementary school to UCI students on campus. Discussions and questions with students helped to support what they were learning on campus and in their field experience. 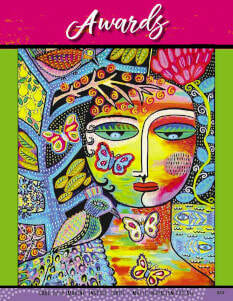 The elementary reading course evolved into a language/literature based course and was highly successful. When the State Teacher Credential Department changed the teaching credentials and requirements: Multiple Subject Credential (K-12) and Single Subject Credential (6-12), the State Credential Department required classroom experience in elementary schools in the area of reading. This requirement was included under 105LA. In addition, the California State Credential Department established reading course requirements for all teacher education programs throughout California. The goals for the reading course were guidelines for the development of objectives to be completed by the students and were a part of the accreditation process. The 10 weeks of the quarter did not allow sufficient time to include diagnostic and prescriptive elements of reading problems that our students needed to be effective reading teachers. I approached Dr. Bailey about changing the emphasis of 105LA and was given a “green light” to develop the diagnostic/prescriptive reading course, and the elementary classroom experiences were added to 105A with specific goals and objectives to comply with the state credential requirements. During my time at UCI, I also supervised student teachers in several school districts and conducted student teacher seminars. We developed Student Teaching Centers at schools selected by the school districts in conjunction with UCI OTE. At the Centers, five to six student teachers were placed with selected master teachers and the supervisor became a part of the school staff two to three times per week. I worked with the student teachers, master teachers, and principals. A granddaughter and a different course brought me to a retirement decision, and I worked part-time for two years supervising student teachers until 1992. During my time at UCI, I witnessed excellent accomplishments in the Multiple Subject Credential Program and the development of the Department of Education. I only saw a promising future for teacher education. I am proud of our bright past and look forward to the brilliant future of the School of Education.